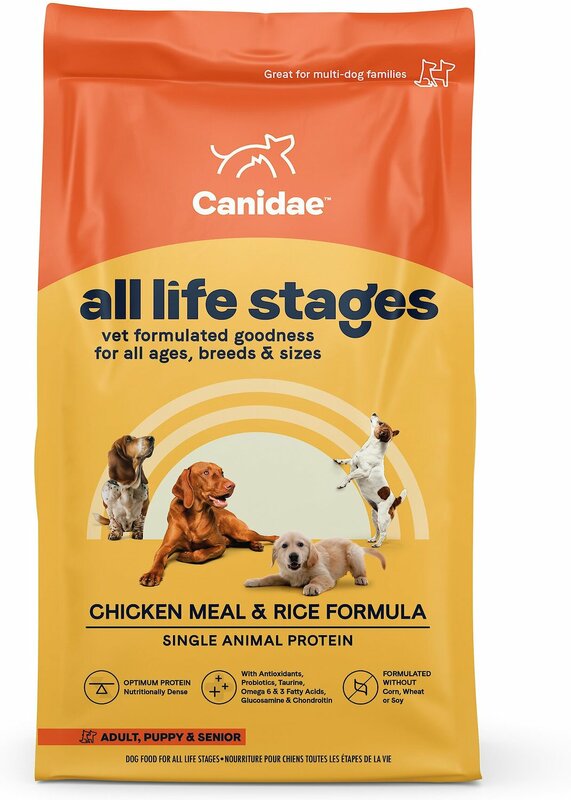 Canidae All Life Stages Chicken Meal and Rice is designed to be an affordable yet quality dog food for those that have more than one dog in the home. For dogs that have no sensitivities to poultry, this is an outstanding option that is easy to find. Formulated by a veterinarian to provide complete and balanced nutrition to dogs of all ages, breeds, and sizes. This is part of what makes it so suitable for homes that have more than one dog and want a kibble they can feed to everyone. Vitamins and minerals added to ensure a complete and balanced diet for all dogs. High protein formula promotes lean muscle mass and helps dogs maintain a healthy weight. Probiotics make this suitable even for dogs that have some stomach issues. Nutritionally dense so you feed fewer cups of food. A 30lb bag goes a long way even in multiple dog households. This is a good dog food. One potential problem is that since the main ingredient is chicken, dogs with poultry allergies may not be able to enjoy this food. Keep in mind that the chicken in Canidae is higher quality than the digest and poultry by-products that are often found in budget-priced brands like Alpo. For some dogs, this can make all the difference. Chicken Meal, Brown Rice, White Rice, Rice Bran, Cracked Pearled Barley, Peas, Chicken Fat (Preserved with Mixed Tocopherols), Millet, Tomato Pomace, Natural Flavor, Flaxseed Meal, Potassium Chloride, Choline Chloride, Sun-cured Alfalfa Meal, Inulin (from Chicory Root), Lecithin, Sage Extract, Cranberries, Beta-Carotene, Rosemary Extract, Sunflower Oil, Yucca Schidigera Extract, Dried Enterococcus Faecium Fermentation Product, Dried Lactobacillus Acidophilus Fermentation Product, Dried Lactobacillus Casei Fermentation Product, Dried Lactobacillus Plantarum Fermentation Product, Dried Trichoderma Longibrachiatum Fermentation Extract, Vitamins (Vitamin E Supplement, Thiamine Mononitrate, Ascorbic Acid, Vitamin A Supplement, Biotin, Niacin, Calcium Pantothenate, Pyridoxine Hydrochloride (Vitamin B6), Vitamin B12 Supplement, Riboflavin, Vitamin D3 Supplement, Folic Acid), Minerals (Iron Proteinate, Zinc Proteinate, Copper Proteinate, Ferrous Sulfate, Zinc Sulfate, Copper Sulfate, Potassium Iodide, Manganese Proteinate, Manganous Oxide, Manganese Sulfate, Sodium Selenite), Papaya, Pineapple. Gradually switch your dog over to Canidae over 5-10 days. The shorter time period can be used for dogs that have no major sensitivities whereas the longer 10-day transition is best suited for sensitive or special needs dogs. Replace a small portion of your dog’s regular food with Canidae until they are eating nothing but Canidae. Canidae does a good job paying attention to the needs of multiple dog households and busy dog parents. This chicken and rice formula is great for dogs of all ages and breeds. The trio of probiotics and carefully selected vitamins and minerals make for a balanced and easy to digest daily kibble for almost any dog. The kibble size is manageable for smaller breeds and easier to crunch down for the big dogs in the house. If you are tired of attempting to feed a ton of different types of dog food to your multiple dogs, this is a formula you should consider.